This procedure is an addendum to the main strip down guide located HERE and will guide you towards Supertuning the mount to get better results. This guide needs to be read in conjunction with the main strip down guide and shows how to get better tuning with the RA and DEC worm gears by using additional shims to set the worm gear to worm roller more accurately. 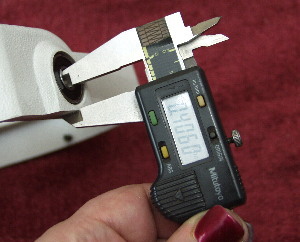 This guide also includes a shim calculator so you can automatically calculate the shim sizes required when rebuilding. I am going to break with convention for supertuning in this guide and NOT replace the main bearings. Much discussion about these has taken place in various guides and forums but the fact is the main bearings are perfectly adequately engineered for a mount like the EQ6. The only bearings I changed in this guide were worm roller end shaft bearings because these are generally pretty poor quality from the factory. The other bearings are more than adequate as the mount does not need high speed bearings and ceramic bearings are prone to potential problems in cold weather. The supertuning element is concerned with the setting of more accurate worm gear alignment. Its assumed if you are carrying out this process you will have carried out all steps for improving the mount in the strip down and rebuild guide with regards to cleaning and deburring components and replacing the factory lubricant with a lithium type grease. 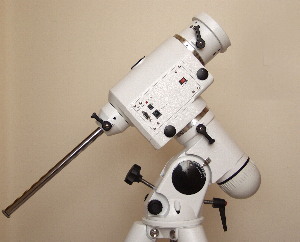 The EQ6 mount used for this guide was a new model and was probably manufactured around 2009. 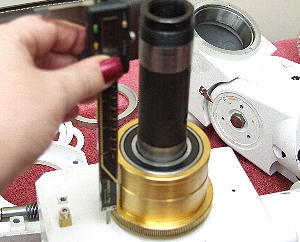 The overall machining was far better than on the earlier mount used for the strip down guide and engineering tolerances were significantly better. The mount showed a better quality lubrication although it was almost dry in places and a generally 'cleaner' level of engineering with none of the swarf and drek found in the earlier generation Synta mounts I have disassembled. 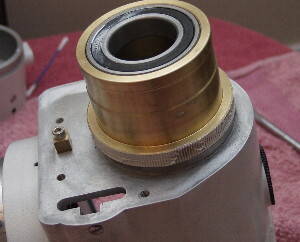 The only parts acquired for this guide were the worm roller end shaft bearings and some additional shims. Details of these are as follows along with a complete bearing list if you find any of your bearings have been damaged or are unfit for use. 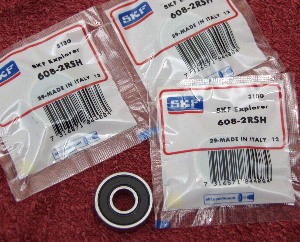 These are fairly standard bearings and can be acquired almost anywhere. Mine were acquired from ebay relatively cheaply. A complete list is supplied for your information although for tuning only the worm roller end shaft bearings are worth replacing in my opinion. There are very many manufacturers of bearings, SKF bearings are relatively common in the market place and these were used. Other manufacturers part codes may differ slightly - if in doubt check with your supplier. In addition to the tools required to do the mount strip down for supertuning you will also require the use of a digital caliper. These can be acquired readily at reasonable prices from sources such as ebay fro around £20. Here is all the equipment ready for work. 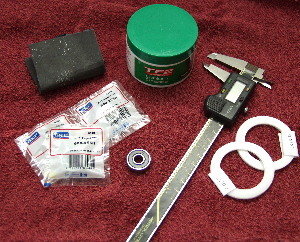 Emery cloth, replacement bearings, Delrin shims, digital caliper and of course lithium grease. 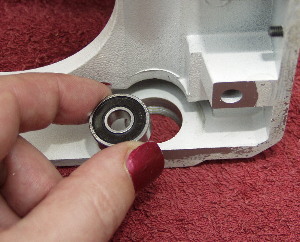 This is a picture of the replacement worm roller end shaft bearings. These are superior quality to the ones that the factory fit to the mount. 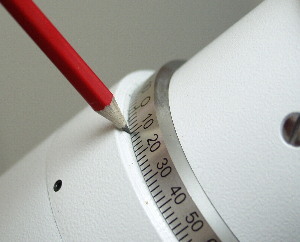 ......Here is the measurement in close up. From the top of the gear teeth of the worm bearing to the face of the mount. Obviously when you do this the digital caliper must be square to all faces. 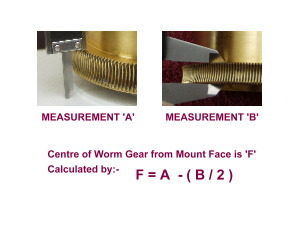 Make a note of this measurement which we shall call 'A' Now measure the depth of the worm gears machined teeth and make a note - this is 'B' Measurements 'A' and 'B' are used to calculate the centre of the worm gears teeth from the mount face. This is achieved using the simple calculation above. The result of this calculation is measurement 'F'. You can however simply enter your measurements into the calculator on this page and it will carry out the shim size calculation for you. Replace the worm roller end shaft bearing into the worm carrier having first made sure it is suitably lubricated with lithium grease. 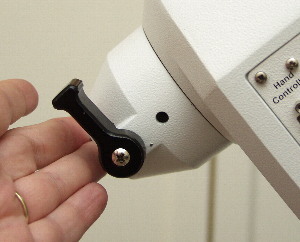 Measure the distance between the edge of the worm carrier and the inside of the worm shaft end bearing. This will be a measurement 'C' make a note of this. Finally measure the width of the worm roller end shaft, this will be measurement 'D'. Make a note of this. 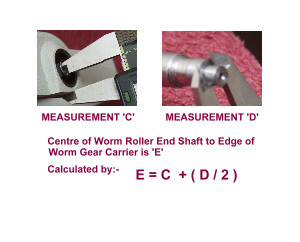 Measurements 'C' and 'D' are used to calculate the centre of the worm rollers teeth from the base of the worm carrier. This is achieved using the simple calculation above. 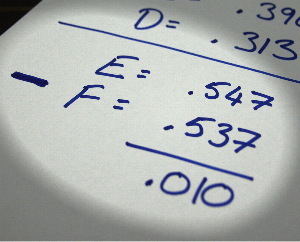 The result of this calculation is measurement 'E'. You can however simply enter your measurements into the calculator on this page and it will carry out the shim size calculation for you. Now Simply Subtract F from E and you have the shim size required. Note: Sample data from 2 other EQ6 Mounts is given in the tables below to give you some idea of what sorts of numbers you should be seeing. All of these calculations are done for you by just entering your A, B, C and D measurements into the following table Enter your A, B, C, D measurements into this table to calculate the correct shim to place between the worm gear and the bearing face. Note: When you click SUBMIT the page will reload and you will need to scroll down to the table to see the result. To provide you with sample data these are the measurements from an EQ6 DEC gear. Tolerances are fine so no shim is required. Here is another sample from my own EQ6 RA gear. As you can see tolerances are fine and no shim is required. Finally here is the data from an EQ6 RA gear which has been poorly set up from the factory. A .010 shim is required. 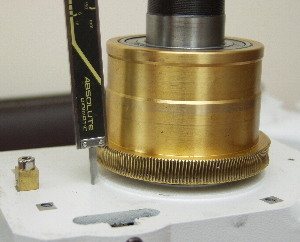 Replace the gear ready for assembly with the correct sized shim washer from your calculations. The EQ6 used to create this guide actually needed no shims applied to the RA axis as it was perfectly well set-up, the large amount of play in the RA axis was tuned out just through a rebuild and relubrication and careful setting of the worm gear during the worm tuning stage. 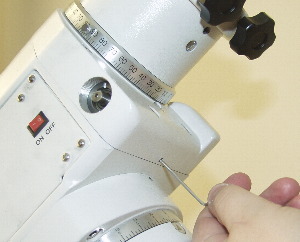 The DEC shim size for the mount rebuilt in this guide was actually a negative number. 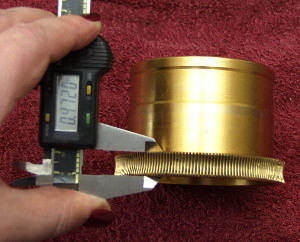 Even the factory shim was (at least by calculation) too large. The mount was originally rebuilt with no shim at all however this produced a problem whereby pressing on the weight bar collar as in the picture above..... Produced a noticeable rise in the DEC axis visible by a gap appearing in the area indicated by the point of the pencil in the photograph. Successive rebuilding of the DEC axis produced variable results including a .010 space opening in the DEC collar where the pencil is pointing. In the end I settled for a .010 shim which although technically too large did, with sufficient tuning produced a mount which would run without motor stall or play. 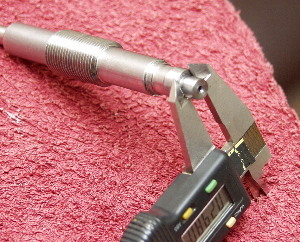 The mount used in this guide was over time tuned to a much higher degree than when it left the factory and after the stages described in the EQ6 strip down and rebuild guide and the supertune guide it operates far more quietly with no play in either axis. My thanks to all the people who have encouraged me to create this guide and who have offered help and support in the making of this guide. You know who you are and you have my gratitude.